Being a bit of a boat nerd, I was fascinated to find the website marinetraffic.com which shows the position of all the major boats around the world. As well as showing the position and direction of each ship, you can click on the marker and see full details including photographs. OK, so the vessels tend towards the larger and less modellable types but it’s still fun to watch. For example, as a keen Isle of Man fan, I can watch the progress of the fast ferries from Liverpool. In fact the system is so good, I can watch the ferry approach Douglas harbour and then bring up the appropriate webcam to see it arrive. Can you tell we are quiet at work at the moment ? 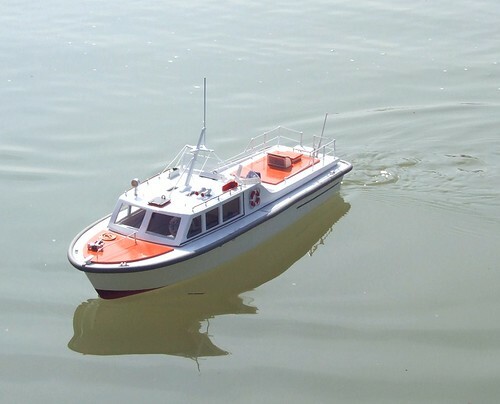 Even railway modellers can enjoy tracking boats – if you can find out what the name of the vessel carrying the next batch of goodies from China is, you can track it and know when your local shop can expect its next delivery. What amazed me is the sheer number of boats out there. 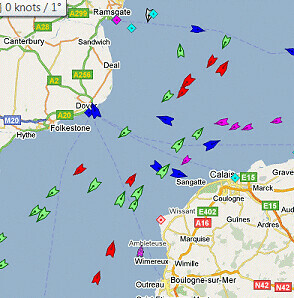 Take a look at the English Channel and it looks like a busy motorway. Once upon a time the cargoes from all of these would have been offloaded and sent on their way by rail. Now it’s a mix of road and rail transport but all this is like blood running around the veins of the country and keeping it going. When we build models it needs to be remembered that we are illustrating just a tiny slice of this world. Beyond the boundaries of the baseboard there is the rest of the country to consider. I know people bang on about proper operating of model railways and I’m worst than most at paying any sort of attention to this, but when you see the high level view of the transport system in operation, it does make me think there is a whole lot out there I simply don’t understand. I don’t normally prime plastic before painting but since the railcar had received quite a lot of attention from knives and abrasives, a thin coat seemed like a good idea just to show if there were any horrible scars. Primer comes from Mr Halfords excellent aerosol cans whereas paint needs to be laid on using an airbrush with all the resultant cleaning and faffing around that that entails. The results looked promising, not perfect but near enough for what is supposed to be a quick fun project. Where the raised lining lines have been removed the replacement transfer versions will distract the eye and a reasonably thick coat of paint should do the rest, or so I hope. Even the joins between bodyside and end aren’t too obvious. Happy with the grey base I gave the bottle of Precision “Early Multiple Unit Green” a good shake. Opening it up, the paint seemed thicker than usual but I prefer it this way. You can always add thinners (white spirit in this instance) to taste but going the other way is much harder. Perhaps someone needs to invent the paint equivalent of cornflower ! A paint cup of green later and I have a nice, slightly shiny, railcar body. The colour seems a bit bright to me, and if anyone thinks I’m wrong, please let me know. Contemporary photos aren’t much help as those few that are in colour seem to have been taken on some very dodgy old film stocks and the rendering can’t be described as accurate. I don’t have a great history with this colour either, my 07 diesel is finished in Brunswick green rather than the correct Malachite. The finish is good and the weathering went well so my enthusiasm for sorting this out is tiny. People are normally too polite to mention it at shows anyway. Some of you will be thinking, "Why is he bothering with this ?" Well, there are a couple of reasons for this post. 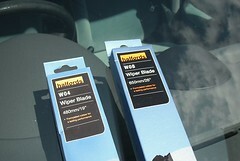 First, after a hard winter my wiper blades needed to be replaced. They were OK but only just and didn't really clear the screen as effectively as they should. Second, I heard someone at work express the need to "get a man" to change the wipers on her car. That's a phrase that always annoys me, after all if men are (rightly) expected to be able to cook, clean and look after children then the flip side is women can do minor car maintenance. So, here is wiper blade replacement without any need to use a willy. Step 1: Get the right blades. A Peugeot 206 has different sizes each side so you can't buy a handy and cheap set from Halfords. On the drivers side the blade is 19 inches long and for the passenger 26 inches. Please note I am talking about a right hand drive car here although I suspect left hand drives are the same. 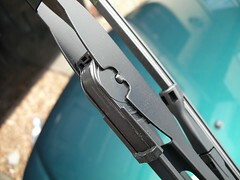 Step 2: Remove the blades from the end of the wiper arms. Pull the arm toward you and at 90 degrees to the windscreen. The blade should slide off if you pull it along the arm towards the glass leaving a hooked metal end. There might be a tab to squeeze to make this release but finger pressure ought to be enough. Be careful - do NOT let the arm slap back or you'll be calling a nice man to replace your windscreen. If you want to be sure, a wad of newspaper where the wiper blade will normally be isn't a bad insurance policy. Also, do not operate the wipers until the job is done unless you like scratches in your vision as you drive. 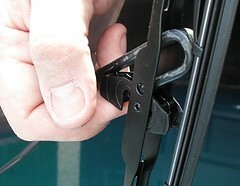 Step 3: On the drivers side, the wiper blade unit comes with a couple of plastic adaptors. 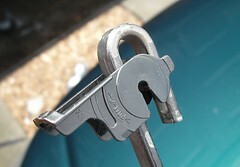 Use the big chunky one and hook it over the metal bar in the wiper. 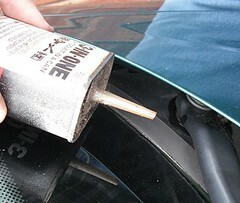 Then slide the whole lot into the metal hook on the wiper arm. The photo shows the job half done. Don't worry, the rubber blade will bend to allow you to do this. Step 4: The passenger side blade comes fitted with an adaptor. It caused me a fair bit of head scratching at first as I couldn't work out how it fitted to the wiper arm. Eventually I removed it from the blade as this made trying different orientations easier. As you can see from the picture the arm goes up the middle with the adaptor surrounding the hook. Note: it's at 90 degrees to final orientation in this photo. Putting the blade back into place I hooked the unit over the arm. It's quite a wiggle to get the thing to fit but fit it does and snaps into place nicely. Step 5: Check the blades don't slide back along the arms - be fairly brutal here as you don't want them moving when doing 70 on the motorway in the rain. I had a blade move in the snow and it was bad enough to have to stop in a side street and get out of the warm to fix it. Step 6: Now test your wipers. If they are fine, fire up the windscreen washer. Can you see ? Are they still secure at the ends of the arms ? Congratulations, you've saved yourself a few quid and can now replace a duff wiper at a service station in the middle of nowhere when "a man" is not available. Step 7: A final touch is to oil all the pivots in the mechanism that you can see. While not essential, it's a good time to do it as we don't want anything seizing up in the wet do we ? 3 in 1 oil is good here, don't use WD40 as while it will clean out water and even muck, the lubricant properties for this application aren't that great. Legal note: This is an accurate description of what I did. If you chose to follow these instructions and things don't work, it's not my fault. Sorry. In a Park Royal Railbus the designer hadn't allowed much space for the driver. He was expected to sit in a little cubicle at the end of the vehicle, slightly more roomy than that provided in a Routemaster bus but not much. According to Branchlines, and I'm not going to argue, his seat was quite impressive with a substantial headrest which looks like it would not only have prevented whiplash but keep his face pointing forward with blinkers to prevent side vision. The partitions fit into a half etched line in the floor. After quite a bit of fiddling I managed to get the angle right and fitted the first one. On trying it in the plastic body it became apparent that the front needed to be reduced by a couple of millimetres. Easy to do before you fit it but a bit more awkward afterwards so be warned. The other modification carried out is to split the floor in two. Without doing this I don't think it's possible to fit it into an assembled bodyshell, or at least I could do it. A quick snip with the scissors and now I can drop each end in by flexing the sides a little. When the railcar kit came to me the floor had been removed from the etch and all the seat supports folded up. The builder had tried to brace these with a little bit of solder but not to any great effect. There are two sizes of seat supplied, wide and narrowish. Once released from the fret they have to be folded and the located on the supports using a tab on the later. Initially I assumed that the tab went all the way through the slot but this isn't the case, it's not long enough. All it does is locate the back and solder has to do the rest. The different widths are marked on top of the supports with X's and O's to aid assembly. Assembly once you realise all this is simple - locate the seat and then grip the top of the support and the base with some sprung tweezers. Then run solder up the back to fix the two together. My worry was, would the things fit in the body ? Is the web the future ? Since it's Sunday, how about a little sermon ? Rupert Murdoch has taken the decision to hide the Times website behind a “paywall”, if you wish to read the newspaper online, you’ll have to pay for it. Lots of people have said that this is a mistake and that the audience will just go elsewhere for news. If Rupe wants readers then he will have to revert to giving it away for free - web users have got used to the concept that everything costs nothing and won’t pay. For me this is an interesting discussion as I have a foot in two camps – I write this blog and don’t charge anyone to read it but is you want to read my contributions to magazines you’ll be handing over some cash. For me, the difference comes down to quality. On the blog you get what you pay for. Words get chucked on to the screen with little more than a cursory proof read. Typos and even complete gibberish will get through this less than rigorous editorial process. It’s not rubbish but I will never claim that you’re getting the greatest prose either – that’s not the nature of a blog which tends to be more immediate than a printed publication. The subjects will be whatever I feel like writing about and in whatever level of detail appeals at the time. You can probably tell how much time my real jobs are taking up by looking at the quality of my output here ! Magazine work receives much more attention. The subject might well have been seen on the blog, but on the printed page will be better balanced and comprehensive. I’ll probably skip over some areas which merit little attention even if they have been filling days of posts and instead focus on the interesting bits. The text will be read through many times both by me and the magazine editor. Even the photos are better – publication shots are taken on the cameras manual setting whereas the blog gets the easier to use Auto version resulting in less depth of field. All this effort should result, after publication, in a cheque. Many on teh interweb believe is that the printed version can be completely replaced by the blog/web one. I disagree. If you want top quality content then people have to be paid. If the author doesn’t get any money then they simply won’t be able to produce the words, Sainsbury’s is pretty hot of getting money out of you for food after all. The words then need the services of an editor and probably a designer to polish the product. You can argue that this doesn’t matter, all their efforts will be replaced with thousands of people who will contribute for free and to a certain extent you are right. The internet is full of peoples web sites but very few can be described as authoritative as a book or even many magazines. Some can but that’s only because the creator has decided for their own gratification to put the effort in. Obviously if someone has a proper job making the website then this isn’t the case but how often does that happen for sites focusing on hobby matters ? A parallel in our hobby is the exhibition circuit. Some people will haul their tatty, badly working, train set out every weekend to little events which pay no expenses, expect the exhibitor to fund accommodation and probably don’t even feed them at lunchtime. The better layouts who have their pick of shows expect more than this, not luxury necessarily, but petrol money, food and somewhere to sleep preferably with en-suite. While they might also do the odd event just to test a new model you can be sure that won’t last long. In the same way, there are good web resources but there are a lot more ones with infrequent updates, poor imagery and sometimes slightly crazy opinions. Advertising should be the great saviour of course. Put a couple of ads on the page and the income will allow you to develop the content and live a life of luxury. Except it won’t. Click through rates for internet advertising are tiny, frequently less than 1% of people looking at a page will use an advert on it. If the advert isn’t clicked then the host gets no money. To give a pertinent example, the adverts on the side of this blog raise me around £60 per year. Most days over a hundred and twenty people hit these pages and yet rarely will more than 2 click an advert. Often no one clicks at all despite it costing nothing to do so. I’m doing well too, very, very few people with adverts served up by Google see any cheques at all as the money isn’t sent until you reach £60 worth of income. A very tiny number of websites can sell space on the page but advertisers aren’t stupid, they know online they only have to pay for the adverts that do some good and bring people to their website. Look at any magazine though and you see pages of adverts because businesses see the benefit of reminding people they still exist. The upshot of this is that in my opinion, if you want quality reading, you have to pay for it. The same goes for all other electronic content be it music or video or games. Yes, you can find people who will produce top quality stuff for free but they won’t be able to give you the consistent results that someone working full time can. As far as journalism goes, this should require investment and so it’s not unreasonable that this should receive a financial return. It’s painful to say it, but I think Murdoch has a point. He’s also being pretty honest compared to other publications that seem able to lose millions – the Guardian burns £100,00 per day for example. As I’ve said, online advertising isn’t going to save the world either, the Guardian brings in 85% of its advert income from the print edition as opposed to 11% from the web. That’s not sustainable in the long term even for a group that has millions of pounds of assets - none of the model railway magazines have anything like this generous a cushion ! Murdoch is playing a waiting game. He will lose online readers but the Times isn’t a charity, those he loses he won’t miss. Better that they go to others who want to add the cost of the infrastructure to support them (servers, bandwidth, support staff) to their own loses. To use another toy-train world parallel, we would get far more people into our exhibition if we didn’t charge an entry fee, but to do that would bankrupt the club and the exhibition would cease to exist. The future may be electronic but the dead tree press has a lot of life in it. Maybe some sort of micro-payment scheme will appear to plug the funding gap, or maybe only people who need no income will be able to publish. Let me know what you think. Then prove me wrong by hitting some of those adverts on the right and making me rich ! What do you think ? Comment away ! Kadets lifebelts are the usual single white plastic moulding found on model boat supplier stands at many shows. A quick coat of paint is all that is required before they can be fixed to the superstructure. Since this is a reasonably large scale model I felt I could get away with gloss red for the main body. Over a white base this works pretty well - red paint has hopeless coverage so if the moulding had been whitemetal I'd have gone for a matt base coat followed by gloss. The ropes are painted with an off-white colour. My pot of Humbrol 147 needs replacing so they are a bit greyer than normal but still OK. The white bands are IMHO the masterstroke. Rather than try and paint them on neatly, I used some strips of insulating tape wrapped around the edge of the ring. The tape was stuck to the modelling board and 2mm wide strips cut and wound into place. In hindsight I realised that this is pretty much what the prototype has (not with insulating tape obviously) so it looks pretty good. This is why I will always buy RTR locos from my local model shop. On Saturday I was able to walk in and say, "Mark, what colour should that railbus kit you sold me a few weeks ago be ?" Apparently BR Multiple unit green. There are two shades of this and the one to use depends on whether I will be painting the front yellow or using speed whiskers. Since I want the later I need the earlier paint which of course wasn't on the rack. A quick trip down to the stock cellar later and the proprietor returned with a bottle of it. During this time I'd remembered my bottle of Mek was nearly empty. Best of all, in the transfer drawer were some Fox cream lines and whiskers which will apparently do the job. I'm sure my stock includes numbers so I didn't look to see if there were any of these in. All of this is good because I know very little about railway rolling stock with windows in the side and so being able to ask the question is invaluable. I appreciate I'm not the biggest customer, although this changed a bit when he got a machine to take credit cards, I still try here first. The shop has been open for just over ten years and is maturing nicely with all sorts of junk, sorry goodies, building up and making even regular visitors feel a good rummage is worthwhile. Being a good boy, and because I knew things would go wrong if I didn't, the railcar body was left overnight to harden properly before I attempted to sort out the joints and other imperfections. Fortunately the previous owner had already removed all the raised lining lines moulded into the surface by Airfix. The job wasn't shabby either - when I try this I usually excavate chunks of plastic that should be retained. Obviously care and a good sharp blade had been used to good effect. All I needed to do was smooth the corner joins and polish the plastic up a big. When doing this, emery paper on it's own isn't a good thing as fingers have a tendency to make hollows in the surface due to inconsistent pressure being applied. A better plan is to attach the abrasive to a board. Better still, these smoothing sticks came from a tool shop in Birmingham's Jewellery Quarter although I think you can get them from Squires now. Each is fitted with a different grade of emery - the black ones are various flavours of medium and the pink ones very fine. Not the cheapest tools as I recall but very good for this sort of task and I now have very smooth joints. So there I am, sloshing the Mek-Pak around sticking the railbus body together. A little while later I notice my finger. At some point I've obviously got the liquid on it and then touched the bottle. 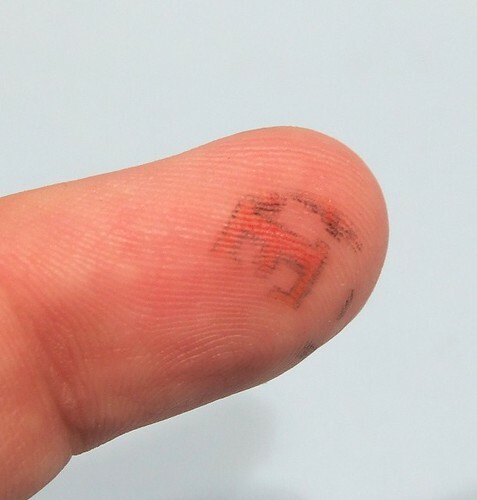 Mr Slater's printing has attached itself to my digit ! There must be a use for this technique. Could I pick up other print and emblazon it elsewhere ? 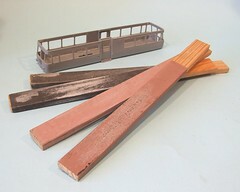 I've got two sets of instructions for the railbus kit. The original Dapol ones and a suplimentary set from Branchlines. According to the later I should paint the body sides beofre assembly and put them together around the interior. The later won't go in through the top of the model in one piece thanks to the tapered profile of the body. Stuff that I thought. The glue will eat my nice paintwork if I try that. As far as I am concerned, the interior can be chopped up to go through the hole. People build models of ships in bottles so a set of seats shouldn't be a problem should it ? Well it better not be as I've already glued the body together. There's 8 parts plus a floor to centend with. Each side is made up of a front and back end plus the doors. Airfix intended these to slide open and closed for extra play value but I've glued them firmly shut. To keep things nice and flat as you can see I put the roof on, being careful to keep fixatives away from it, and weighted the lot with a CD (The best of Miami Vice, £1 from local music shop but others will work just as well) balanced on the edge of a box and a can of soft drink on top. Handy weights these, compact and easy to manage yet a useful source of refreshment and aluminium. Every workshop should have one. On a nice sunny Sunday, the Billing's Kadet took to the water properly. Not the bat this time, real water with other boats and everything ! The model really looks smashing. After a little detailing which I'll mention in a future post, there is just enough complexity to make a plain boat look interesting. The colours have been copied from the instructions and work really well. I'm not sure if left to my own devices I'd have plumped for as much orange but it is right. The blue seat would have probably been black or grey yet it seems to fit the scheme. On the water we had some issues. Firstly the model had no power and made a terrible rattling noise. Battery life was almost non-existent too. The bow was low in the water and top speed pedestrian. 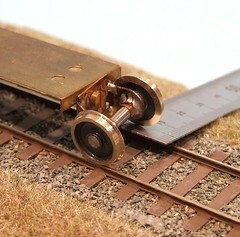 Returning to the bankside workbench I worked out that the cabin back was low enough to touch the drive shaft coupling. Some work with a pen-knife cured this. Not pretty but effective. The waterline was sorted by levering out most of the ballast weight I'd put in the day before. With the model in the bath this appeared correct but then unless you fill the water all the way up, seeing the level isn't easy. A small spirit level showed the deck to be level but on the pond this just didn't look nice. Battery life should just be a case of cycling them through charge/discharge cycles a few times. I've just bought a new charger which will apparently do this for me and get them back in condition. If that doesn't work I'll be looking out for something that holds more charge and isn't much bigger than the pack in use now. While the model isn't supposed to be a speedboat, it ought to move around a bit faster. On that subject, I did have a spare battery pack and thanks to my whittling the model was quieter and faster. There's work to do though. In November I wrote that the Kiddermister show 2010 had been cancelled. 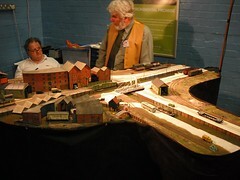 The good news is that it is back in 2011 as the West Mercia Model Railway Exhibition. The new venue is Perdiswell Leisure Center, Worcester. Good to see this show back on the calendar. OK so the move out of Kidderminster means the chance to combine a trip to see the toy trains and the real thing on the Severn Valley Railway is no more, but at least they have a venue. Hopefully one that looks after good customers too ! I’ve never worked in a factory. In fact where I live the largest manufacturing plant shrunk dramatically over a decade and finally closed a few years ago. Even when open it wasn’t visitor friendly and the view from the streets gave little indication what went on inside the walls. All of this makes building a convincing industrial area rather harder than it might otherwise be. 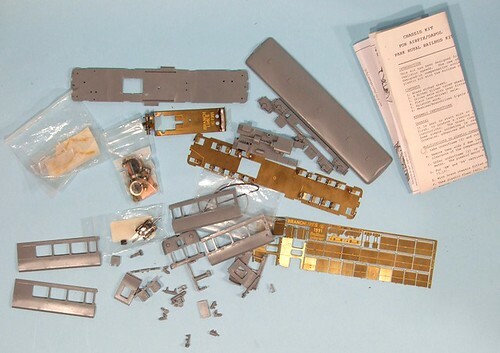 Older modellers will have stood a good chance of spending years in buildings connected by girders and pipe bridges and containing green painted heavy equipment. Studying photos is a poor substitute for all these years soaking up the atmosphere. 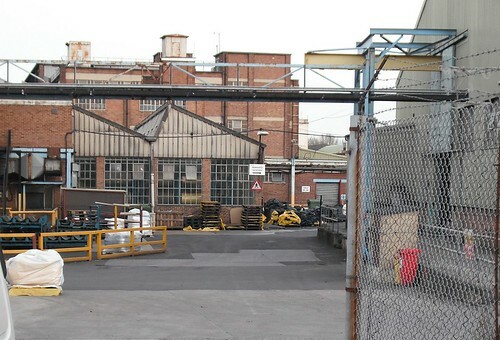 On the way to the pub in Melksham, I passed this view into the Avon Tyres plant. Look at all those pipes, the motley collection of building materials. Slim barred steel window frames have square tops rather than the curved brick versions beloved of modellers but oh so difficult to make convincingly. This isn’t a dark satanic mill from days of yore, it’s a modern plant, but one that could have been built anytime in the last 40 years. I’ll not pretend to understand the tyre making process but I do know that all those pipes and beams and walkways are there for a reason. Unlike the countryside, everything you see was put there by someone. That’s what makes industrial modelling so challenging. Aside from the wealth of detail, the other thing I notice is how clean everything is. While various parliamentary acts have improved things, old photos show that these sort of places weren’t covered in a uniform coating of soot. The maintenance men looked after things to keep them usable on a dally basis. Painted surfaces were recoated occasionally, not left to rot as many modellers seem to believe. All this is very inspirational for me. I want to set my layout in a box around the back of a 1950’s factory complex. Yesterday’s box steel will be in evidence but so will asbestos sheet and concrete rendering. There will still be brick, but less than I’ve used in the past. Hopefully this will lead to a more colourful, but not gaudy, model. Stretching my legs before Trainwest in the morning I found the sides of the neighbouring hanger, now a storage depot for Avon Tyres, appealing. Not the most picturesque location you might think, but I have in mind some structures for the layout in a box (must think up a proper name for this one day). A wall such as this shouldn’t be a difficult construction job, some brick plastic for the base and Wills sheet above this with windows from clear(ish) plastic. Dimensions can be modified to suit the location in both height and length. Getting the colour right will be the biggest challenge. You might say that it’s green, but the connoisseur of green will spot several shades. The original paint has faded unevenly from a blue-green to yellow-green and then a coating of moss or algae has added at least a third paler shade. In the morning sun this all looks lovely. Later in the day the differences in shade aren’t so marked. The other feature of the wall is the building of small and now derelict, brick huts. These aren’t physically connected with the main building so the purpose is unclear. One problem I do have is date – when did box steel like this arrive in the UK ? According to the helpful Wiltshire Council website, RAF Melksham, which became the sports centre, opened on 12th June 1940 as No 12 School of Technical Training. Assuming the hangers haven’t been rebuilt since then this means I ought to be OK for a BR period setting but any earlier would be less plausible, unless anyone knows better ? The Park Royal Railbus kit is more prototypical than I had expected. Now I've actually done some research I find that the power unit was a separate item to which the body was bolted. Quite sensible really as a simple lift would remove the later, leaving the mechanical gubbins available for spannering. 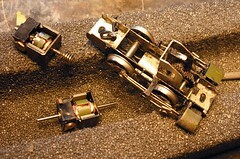 The brass kit chassis is encased in plastic parts. I’d wondered what the holes in the brass either side of the motor and toward the back end were, and it turns out that some plastic pillars go through them and into the body. This allows for realistic separation between the two parts and also enough space for the top of the motor and pick-up strips. 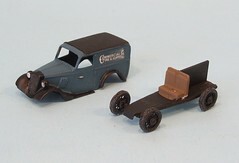 If I was being picky, the plastic details aren’t as sharp as I might like but they are good enough for a working model. If you want to go to town there are definite possibilities to improve matters a little, for example the springs on the end (dampers I suspect) could be chopped out and replace with sections of bolt or even real spring to improve definition. The pictures I have found are unclear but I’m betting that there was a certain amount of pipe and cable work that Airfix ignored for production reasons. 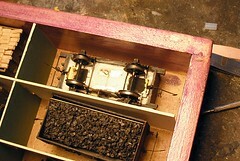 In the original kit the chassis is simply glued in place. On a working model this would preclude maintenance so a single bolt fixing is allowed for. These original pillars will still be used for location but must now remain glue free. A long chassis needs long pickups. 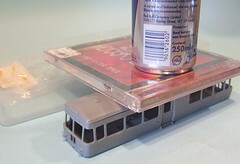 For the railcar fitting starts by gluing a couple of strips of PCB to the top of the metal sheet. Nice thin PCB too, better than the sleeper strip I normally use ! The pickups themselves are phosphor bronze wire. A length is supplied but I swapped it for some thicker stuff which I felt would hold its shape better. This might not have been a wise move as getting the pressure on the wheels light enough so picking up electricity didn't cause braking wasn't easy. Even when working, some weight is needed over the powered axle to get the thing moving. 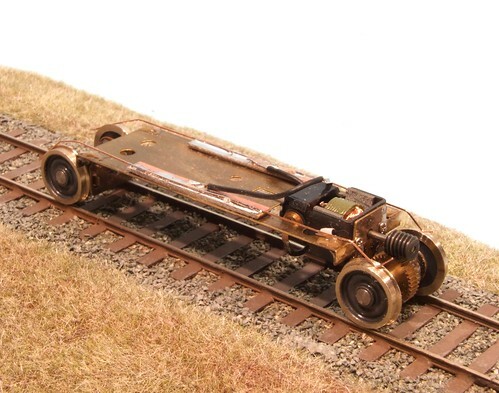 At the opposite end of the railcar from the motor we have a very neat little cradle carrying the wheels which pivots on a bolt to compensate for any wobbly trackwork or a slightly twisted chassis. As the picture shows, there is far more movement than you'd hope to need. Even my track building is better than this ! A return to plastic modelling in this months Hornby Magazine. 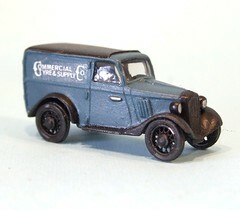 This time my project is an LNER parcels van built from a Kirk kit. An interesting model and there are one or two challenges along the way, but the results are quite pleasing. There were nice friendly people surrounding us - hello to the guys with Willesden Junction, hope you had a pleasant journey back home. In fact lots of nice friendly people were to be found both sides of the barrier. Lots of time was spent chatting and even a little learning. I now know that Jo Brand worked at Hellingly before embarking on a career in stand-up comedy. A little before the time I modelled it so there's no chance of adding a celebrity figure to the miniature population. 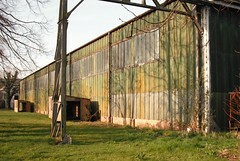 The show itself is held in a sports centre converted from an old aircraft hanger. The inside is nice but the outside is just a little bit uglier than you imagine it could be. Having said this, both here and just around the corner from out (excellent) accomodation there were some buildings that have given me ideas for future projects. More of this at the weekend. Sadly, the first nice weekend of the year meant that the crowds were a little lighter than normal. If you live withing striking distance of the show and didn't go, then you missed out. Both this year and last, the quality has been far higher than you might expect from a provincial show. I'd certainly not have been diaspointed to have paid to come in. In fact, the last word on this should go to our final visitor, Jo. He appeared to be around 5 years old and was a bit tearful at approaching the end of the day. His Dad explained that he had visited all the layouts very methodically. Twice. A few photos on Flickr. Maintenance is a chore on an exhibition layout. What we all want to do is make new things. What we have to do is fix the old ones in time for the next show. Now I have a simple trick with rolling stock. If I take too much, anything that breaks is put upside down in the stock box and left to be mended in the future. Fiddling around behind the layout is best avoided unless you really have no choice. If you think you can drop and lose small parts on the workbench, the problems are magnified when standing up trying to work in the fiddle yard ! As it happens this wagon isn't too poorly. All it needs is a new coupling bar - 5 minutes with a pin and some superglue followed by a splodge of weathered black paint. Then the model returns the correct way up and heads off to the show. By the time you are reading this, I should be at the Trainwest show with the Hellingly Hospital Railway. As usual, preparation meant a quick wheel clean for all the locos. Opening the stock box, untouched since Uckfield least year, I was surprised to find a nice new motor wrapped in a plastic bag. Wondering why I had such a thing - I don't buy them for fun - it was about to go in a handy drawer when I realised. At the show were killed the Hunslet. Somehow the power unit in the little engine had died. A quick scout round saw me swap money with Roxey Mouldings for a new one, which was promptly put in the box and forgotten about. Until now. The defunct motor was quickly removed from the chassis and desoldered. A gear puller make short work of removing the worm, when I remembered I had it and stopped hammering away with a punch to push the shaft out. The rear shaft had to be shortened and contrary to normal advice I do not employ a slitting disk of file - just a big pair of Zebra wire cutters. Despite being 15 years old, they still make quick work of this even though the result is a motor flying in one direction and a bit of metal in the other. Re-assembly was the reverse of the above. Putting the screws in to hold the motor in the (High Level Models) gearbox is easier if you fill the slots with Blu-tack but otherwise things were fine. I'll find out better over the weekend. The railbus is only powered on a single axle - this should be more than sufficient for a tiny rail vehicle that will never pull anything. The gearbox folds up and is soldered to the chassis plate. A little open frame motor screws into place and then wheels ans gears are fitted. The last owner strengthened some of the bends with fillets of solder, not a bad idea as the brass is pretty thin. The gears don't have grub screws to retain them. On the axle a dollop of superglue does the job (Loctite would be more engineeringly but I don't get on with it) and the worm pushes on to the motor shaft without fixative. The result seems to work OK., Top speed doesn't seem too mad but I'll get a better idea once the other wheels are in. If you read classic car magazines, the advice is always against buying part completed projects. You don't know all the bits are there and some of the work may have been bodged. In theory the same rules apply to model kits. 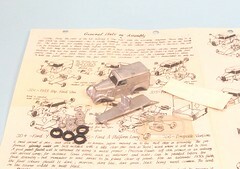 They may look tempting, but if any of the component parts aren't in the box then you could have bought a pile of junk rather than the ingredients for a model you can be proud of. 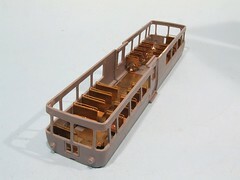 Anyway, a few months ago I was in my local model shop and on the wall was a second hand Park Royal Railbus kit. In the bag was the Dapol model and (this is the good bit) the Branchlines motorising and detailing parts including motor and wheels. £30 instead of 45 which sounded like a bargain to me. 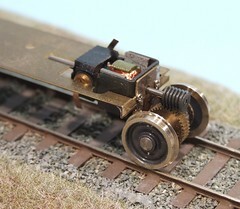 I've always wanted to do one of these, even though I have absolutely no use for one in 4mm scale. While digging out the Ford Y kit I also re-discovered this bag of goodies and thought, "That won't take long and be a bit of fun" so here we are. The motorising parts have been part assembled, the interior bent up and given a touch of solder. The plastic parts are off the sprue and the raised lining sanded off. Instructions are included and for a change I've even taken a look. All the big bits appear to be there and lets be honest, if there are plastic parts missing, a new kit isn't expensive. The results of a coat of Humbrol Acrylic were OK but I felt the model still needed "something". I his book on landscape modelling, Barry Norman recommends spraying entire layouts with a coat of a unifying colour - as I recall this was a very watery grey or beige. The colours would barely change but all would take on a similar tone, the idea being that if nothing stood out then the model would appear more authentic. Once the varnish had dried I eshewed the supplied vac-formed glass bubble as it didn't fit preferring to use some Krystal Klear. Even this dried properly first time giving nice flat "glass". In the end this is a nice model. The wheels lift it a touch above the standard die-cast. Best of all it's another kit out of the cupboard. Now what shall I put in its place ? The trick, as far as I am concerned, with old model road vehicles is to understand that the current rainbow palette of paint hasn't always been available. For me the 1950's and 60's happened largely in black and white and that makes working out colours difficult. Mind you, looking at the colour shots, it seems that most of the world was black and white, or at least a panoply of muted shades. Vibrant colour did exist but it was uncommon and certainly not to be found on the sort of van I'm building. With this in mind I decided to try a blue body with black mudguards. 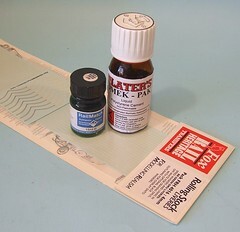 The blue is rail blue from the Humbrol acrylic range. Having always been an enamel fan I only ended up with a pot of this colour when I thought I'd be unable to get real paint in time for a magazine deadline. Once I worked out the plastic pot was screw topped, the paint brushed on well enough with good coverage. In fact it was just as good in this case as the oil based alternative, just less smelly. Not sure I like the move from a metal jar with a push on lid - threads and paint don't mix, or if they do you can't get the stupid top off ! The black mudguards are satin enamel and the top matt. Transfers came with the kit. Being ancient they broke up a bit and on this side wrapped themselves around at the end too. I'll have to show the model looking at the drivers door. The chassis required a tweak to get it to sit flat. Not because of the moulding but due to those rubber tyres not being as round as you might expect, especially where the moulding tab has been cut off. I prefer whitemetal tyres as they can be sanded to give flat bottoms just like a real car will exhibit. Still, gripping the chassis at each end with pliers then twisting soon sorted things out. The Ford Y headlamps are exposed bowls in the style so popular with long bonneted cars from the 1930's. Since I only had one casting in the bag of kit bits and my prototype research (Preserved Lorries by Keith A. Jenkinson) showed that 2 was de-regeur for this vehicle, I had to improvise something. Luckily in the pin drawer I have a few plastic headed pins which were very nearly the right size. Perhaps a a touch overscale but not enough to worry me. Filing one side flat - the plastic is harder than expected but nothing that a fine file can't handle - produced something pretty good. The pin part was cut short and inserted through new hole drilled in the bonnet sides. The photos show the lamps to be fitted quite close to the radiator rather than the top of the wing location intended by the kitmaker. Aside from this, a little cleaning up of flash and the body is ready for primer and paint. I've been a bit jaded recently. Lots of (proper) work with silly hours and "relaxing" with modelling projects that simply haven't worked out. To be honest I've wondered if stamp collecting wouldn't be more fun. I knew what I needed - something nice and simple to make. A bag of bits that just need to be stuck together. No soldering. No spray painting. No pressure. Digging around in the unbuilt kit pile I found this little beauty. 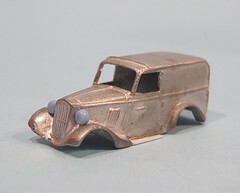 A whitemetal kit for a Ford Y van from Malvern Manufacturing Ltd. Bought from a stand at an exhibition somewhere that I can no longer remember, it's doubtless been superseded by something ready to use and die cast. That doesn't matter, I can reduce the kit pile and make something suitable for a future project. The kit is nicely cast with just a bit of flash in the rear windows. The lattice work wheels are very nice and the big surprise is that rubber tyres are provided . Not sure why really as you can't tell what they are made from when painted and casting the wheels as a whole would almost certainly result in something rounder. The instructions are a work of art featuring hand drawn exploded diagrams in that slightly amateurish style I would so love to be able to emulate. For some time I've had my Dad's Kadet kit in the queue for work. The boat needs wiring up and a few finishing touches with the paintbrush before its maiden voyage. As it happens, the result gives quite a good picture of the basics required to run and control a simple model boat. On the right there is the receiver. Wires run from this to the steering servo at the bottom of the photo. Another set runs to the right where we have the speed control (Viper 15A as I had one handy and they've never let me down). This is wire to the motor and also the battery - on charge while the picture was taken but will lie in the middle of the wooden frame. 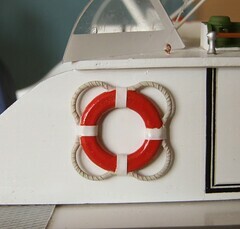 The aerial wire has been fitted around the edge of the hull just under the deck. Not sure if this will work OK until I get the model on the water. In the bath, its sitting quite high in the water so there is a chance I'll be adding a bit more ballast to sort this out. Mind you, if that is as bad as it gets then I won't complain - far better this way than trying to lighten the model to raise the waterline ! Spotted in our club library - these newly acquired issues of Model Railway News. Despite being nicely bound by the original owner you can see how World War 2 affected railway modellers. The issues from the later part of the period are on much smaller paper than those before and a few years after the conflict. The paper is worse quality too, the 1940 pages are still white whereas 1944 have yellowed. In one editorial mention is made of restrictions on paper, the magazine was allocated only 20% of its normal supply, and difficulties in supply to the news trade. Readers are recommended to order copies on subscription to ensure delivery. Despite this, the contents are still excellent. Famous authors such as Norris and Ahern make appearances. There are photographs, in fact Mr Ahern writes a very interesting article on taking these and uses a set up very similar to the one I use today. The quality of illustrations is amazing too. Presumably more people were trained in technical drawing and so plans and diagrams are clearly presented. Skimming through it looks like railway modelling continued throughout hostilities - the Hun wasn't going to deprive us of our train sets - understandably people wanted a distraction from the war and so they beavered away in their workshops with what limited facilities and materials were available. Those workshops were also exhorted to join the effort with a good clean up to aid the scrap metal drive. 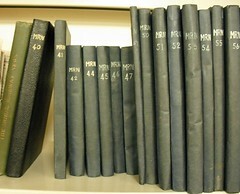 Finally you can tell a lot from looking at the dates and sizes of the magazines. Early one we expected a short conflict (in 1941 a possible cessation of fighting is mentioned) but later had to diver more and more resources to the war effort. In Britain this didn't really end in 1945. Rationing continued and MRN stayed small until the end of the decade. The first I knew of the Build the Victory partwork was when I spotted visitors to this blog coming from the website. Apparently there are some TV adverts too but I've not seen much telly for weeks and anyway we're not convinced by the commercial channel, nothing wrong with Auntie Beeb etc. But of course I had to go out and buy the first edition. The cheap one. 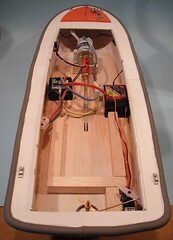 Inside I find some nice laser cut wood for the front of the boat, a DVD, two pamphlets and a kit for a 12 pound cannon. Apparently if I keep buying the magazine, in an indeterminate number of weeks I will have built a 4 foot long model of the Victory. The photos and films certainly make the resulting vessel look really impressive. Were I at all interested in ancient sailing ships this would be a tempting prospect. At this point people will be wailing "It costs lots of money" and they might be true - I can't work out exactly how much as there is no indication of how many parts are in the series. However these things usually end up at about 800 quid - not bad when you consider that the Jotika version comes in at £724 and I suspect that partwork version has more full some instructions. Anyway, I built the cannon kit. I sticks together OK although the wooden parts didn't take to superglue as well as I expected. Maybe the stain colouring the wood resists the glue ? 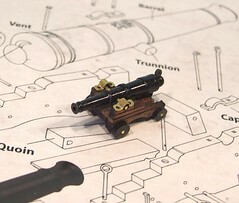 As often happens, the instructions don't quite match the parts supplied - the brackets either side of the barrel have holes in them for nails wheras the instructions show bumps in their place. 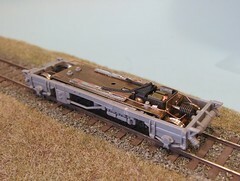 The parts are quite nice, the barrel and wheels are cleanly cast metal. £1.99 probably isn't a bad price for the cannon on its own and if you rally get keen the instructions give enough details to build a full sized one !